The best shows are usually the ones that are most laid back. I've always enjoyed attending the low-difficulty shows like a Cars and Coffee, where people aren't necessarily worried about polishing their cars, because there aren't any awards to go around. We're just standing around chatting about cars, making friends, and enjoying a cup of java. This particular show takes place on the first Saturday of every month on the street in front of EASY in Emeryville, CA. The show has traditionally been the gathering place of R Gruppe members, but there is always an eclectic mix of other Porsches in attendance. Word is last month a 918 Spyder showed up. This month the EASY team wheeled out their recent LeMons C-class winning 908/14, which was definitely a treat. More than that, though, it's the people. Dozens of Porsche folk from all around show up to this event, and that is what makes it great. If you have a vintage Porsche, chances are some of the parts on your car have come through EASY. 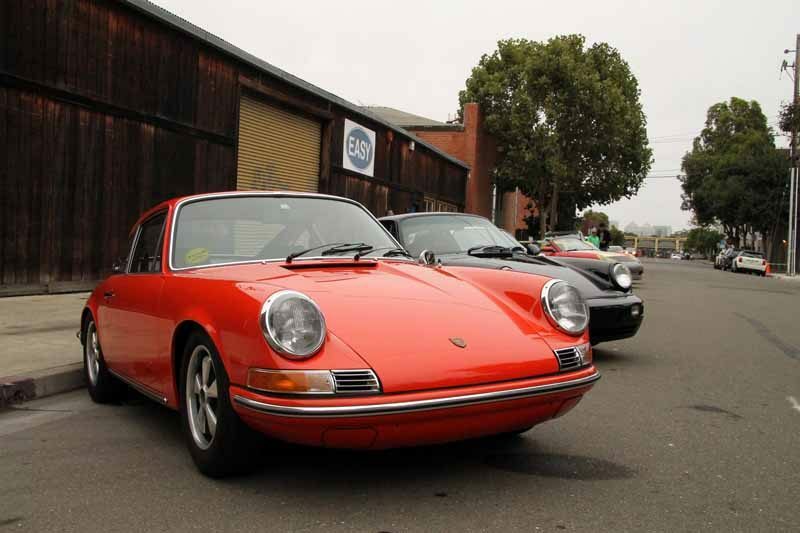 For decades, they've been the go-to source for used Porsche parts on the west coast, and walking through their shop today you still see thousands of quality used parts. I don't know how they keep it all organized, but Jim, the owner, could probably find anything you asked him for. If you talk with the crew at EASY, you get the sense that they appreciate the way the market for cars is going, but it is severely cramping their ability to get good junk cars, as everyone is restoring them. If you need something for your car, though, it's worth giving them a call, as Jim can tell you pretty quick whether he has what you need. I saw more 914 targa tops in one corner of the shop than I've ever seen in my life. They've got wheels coming out of the wazoo. Electrical components, suspension bits, doors, windows, fenders, etc. It's all there, just waiting to be picked through. I wish I had an opportunity to spend a few days digging through the stacks of parts there, as I'm sure I'd turn up some old gold. Back to the show, it is now mid-morning, more Porsches have arrived, and most of the pastries and coffee are gone. There is a steady stream of enthusiasts milling about the cars, and an occasional non-Porsche drifting down the lane with a bewildered look on the driver's face. They've made a wrong turn, and suddenly they're face to face with a teeming crowd of P-car nuts. Many of them attempt a U-turn, but others just slowly idle down the street taking in the atmosphere with astonished glares. It's all fun and games until a GT4 shows up, then it's a real party! Some of my favorite attendees were of the long-hood variety. Being that it was a quasi-official R Gruppe meeting, that's bound to happen, though. This particular burgundy long-wheelbase 911 had some great angles. This, however, was my favorite car in attendance. Lovingly dubbed "Captain Kaos" by its owner/builder Erik, this car just proves that short-hood cars can look great too, assuming you take off those awful impact bumpers and give it a nice deep paint job with some gorgeous wheels. The devil of this car is in the details, including the wood shift knob, sunroof delete, and beautifully trimmed brown leather steering wheel. If I were to build myself a 911 of this vintage, it would probably look a lot like this one. I had planned to make the trip out on Sunday morning to attend the NorCal Treffen show in Concord, CA (more about that in an upcoming post). When my wife said she'd be working on Saturday, I decided to make things easier on myself and turn this into a two-day West Coast solo road trip and attend both shows in rapid succession. I loaded up the Boxster with my camera equipment and a change of clothes, a tool kit, a spare, and a few hours worth of music. The 4AM departure and four-hour road trip were well worth it, as we were treated to an amazing display of cars, unequaled camaraderie, and a delicious donut or two. Thanks to EASY (that's European Auto Salvage Yard) for hosting this event every month, it's a real joy.